NEW!! PLATFORM VIDEOS AVAILABLE ON YouTube! 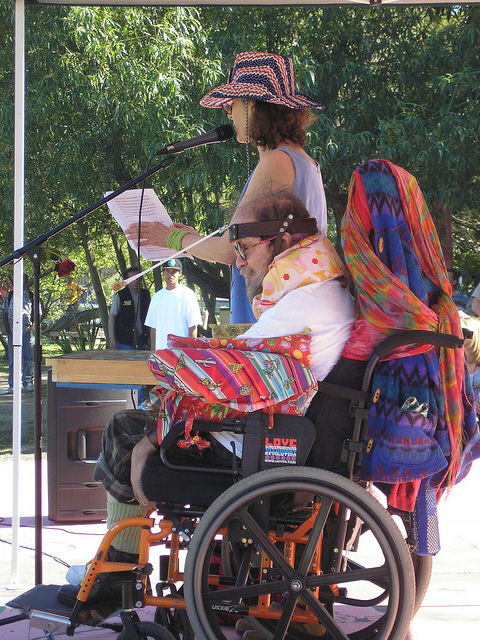 Yesterday our Summer of Festivals of our presidential campaign continued when I spoke at People's Park 39th Anniversary Event in Berkeley, California. Actually I gave my speech two times on different stages. I dubbed the day FROM PEOPLE’S PARK TO THE WHITE HOUSE! I’m having so much fun meeting and talking to people! A lot of people seem to understand finally that the myth of THROWING AWAY YOUR VOTE is a con job keeping us in the limiting boxes of status quo. They are starting to get if you vote for someone who you know shares and is committed to your dreams and interests, it isn’t throwing your vote away…no matter how small the odds of winnings…because each such vote inches things in the right direction! Got up and got all ready for the big day, the festival at People's Park, and soon headed down. We got ready for our first meal packing up to head out! Corey and Alexi had been the first ones to arrive at the park to set up our booth and they said that slowly others arrived. You could see our decorated booth all the way down the street with the little tassels on the top of our booth, inviting everyone in, all decorated in red, white and blue. We found parking easily and the day was beautiful, hot!!! It was a laid back event with a few booths and later a tent set up to give people food but not really vendors, just people giving out information about various things. The park is beautiful with lots of areas for people to hang out under the trees and some areas that have been gardened with flowers! There were three stages set up, the main stage, the poetry stage and a small one at the end of the park. We hung out under our umbrella in our comfy chairs handing out platforms and talking to all the people who came by. And a lot of people gave donations, we were amazed!!!! They took bumper stickers, and buttons and some put them on right away. We had our video running about the platforms and we video taped people’s responses as they came up to the booth. It was a really fun day. We found our coffee right down the street at Pete's and asked for it nice and strong and that is where we also found our bathroom for the day which we were really happy to have. We checked in with the guy at the main stage about what time Frank would go on for his speech and he didn't have him on the list but he would squeeze us in about 4:00, great we had time to go to the bathroom, off we went and then Corey came and told us that we were supposed to be at the little stage at the end of the park right now!! We finished our business and got a really yummy iced tea and then headed back to the little stage in the woods where some musicians were finishing up their set and the mc of that stage did a little stand up comedy. Then we were up! Frank and Linda got up to read Frank's presidential speech dressed in our presidential gear, presidential t-shirts and Linda in a red, white and blue cowboy hat and Frank vocalized with a big grin on his face. Corey video taped it and Mikee took pictures! The speech really drew people in and you could feel that they were really listening and then they finished with one of Frank’s poem. You could feel things change as people really stopped and listened and took everything in. At the end of it the MC said that he was still going to vote for Obama! Frank said Is Obama Here? And he said no! So later he came by our booth and said that he had changed his mind and he would be voting for Frank! I passed out platforms to everyone during the speech and everyone all day was happy to get them. After that speech it was time for us to go on the other stage so we thought we would just go over there and ask when we were up then we could get on both stages. We followed a guy who played the harmonica and there was a big crowd. We read the speech again and again everyone really listened and took the platforms and you could feel things changing. Frank started with “from People's Park to the White House”!!! After the speech we were ready for a snack so Corey and Alexi went off to get us some pizza at Blondies where they had whole wheat crust and organic veggies and it was really good, after that our snack continued with popcorn. Walter Funk came by and he was gathering signatures for various ballet issues. The event was winding down and a marching band made up of a bunch of different musicians was going around the park. We started to break down our booth and then called in our order for dinner at T-Rex BBQ. What a fun day, what an amazing day, what an amazing life! It was so fun to go to the festivals!! We slid right into a space near where we would be setting up the Frank Moore for President tent, and Alexi headed down to Peet's for a couple mochas while Corey started unloading onto the wet grass ... we had brought a big piece of plastic to load onto for this purpose. It was us and the People's Park regulars ... a couple guys playing catch with a football ... very peaceful, and fun setting up. We could feel people watching us ... what were these guys doing ...? And then when the banner went up, you heard, "Frank Moore for President!" The Code Pink women were next to arrive, and then the park slowly started filling up. A beautiful day. The tent went together nicely! When Paul Goettlich stopped by early on, as we were just putting the finishing touches on it, he said that it looked very presidential. There were some people who stopped by before you arrived, curious, checking out the platform, wondering who was this Frank Moore? The girl next door, the local energy one, was interested ... but why the photo?? It was funny that some people just loved the missing tooth FM4Prez photo, and it put others through changes! And then the candidate arrived, and the fun level kicked up many notches! It was a day of many great moments, many funny moments, and a lot of them caught on video! A great idea to have the video set up there to catch the reactions of people to Frank's campaign. And the fact that there were so many donations was amazing ... how Frank always says that poorer people are more generous ... it was heartwarming to see that, and it really felt like it came from the heart. There was a lot of that feeling of people really feeling Frank, and really allowing themselves to feel what a Frank Moore kind of president would be, how things could be ... which was very powerful. And it was really neat what Frank said to one guy, and repeated it to someone else later ... on the subject of "wasting your vote" ... that he could think of his vote for Frank as a "spell" that inches things closer to what we really want. Very powerful. Both of Frank's speeches were amazing, kicked off with great statements with Frank ... back on the small stage in the trees, introduced by the guy Corey who had closed his "comedy" routine with something about his not being gay, and introducing Frank with a reference to the fact that Frank probably wasn't gay either, Frank said: "I am bi. How many candidates would say that?!" It was amazing how Frank's speech and the poem afterward created a kind of deep spell, and it felt like everyone there was totally drawn in, listening deeply. Then, due to the scheduling mix-up, Frank rolled right on down to the main stage for a repeat performance, this time kicking it off with the statement: "From People's Park to the White House!" There were lots of "Right-on"s and "Go Frank! "s from the audience as Linda read his speech ... really great! Then Alexi gave the update from the booth, where more people had come by, reading Frank's platform, giving small donations ... a young guy who loved the "election day will be a paid holiday" platform, recognizing how it would get many more people to vote! Then we made the pizza run to Blondies ... Corey was telling Alexi about Frank's two speeches as we weaved our way down Telegraph. Yummy pizza! Walter Funk was there when we returned ... and then there were more folks stopping by, responding to Frank's platform ... and then the rag tag marching band ... and soon the day was ending ... what a fun day! It was great that Corey came by as we were breaking down the tent to tell Frank that he had decided he was voting for Frank! He had followed up Frank's speech on the small stage with the statement, "Well, I'm voting for Obama." And Frank had asked, "Is Obama here?" Obviously he had thought about that ... no, Obama was not there, but Frank was ... it meant something to him! Last modified April 25, 2008. This site is designed and maintained by Michael LaBash Graphic Design.